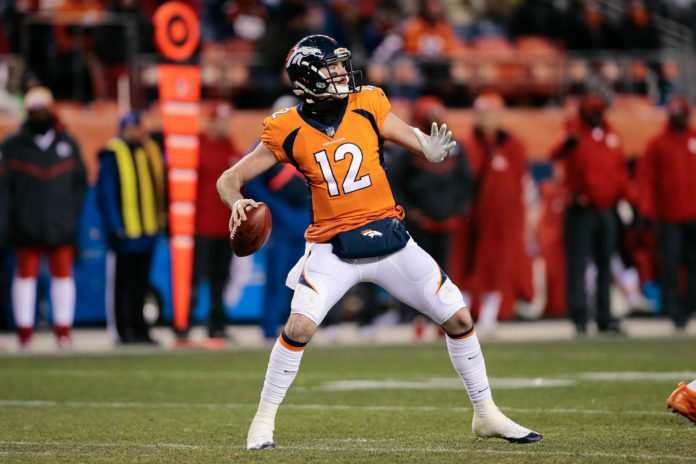 The Denver Broncos will have a crowded quarterback room come training camp as Case Keenum joins Chad Kelly, Paxton Lynch and newly signed former Colorado State quarterback Nick Stevens, all competing for a spot on the roster. While it appears the roster is set with the three quarterbacks Keenum, Kelly and Lynch, with Stevens likely competing for a spot on the practice squad — the depth chart sings a different tune. Case Keenum has been cemented as the starter for day one — but behind him now looms a battle between Lynch and Kelly for the second spot. The upstart Kelly has improved in the off season and Lynch is now battling for what appears to be his Broncos career. Chatting about the quarterbacks is Broncos Blitz podcast host Ronnie Kohrt and special guest Sean Walsh. Walsh talks about Lynch and his potential that may be all dried up — as well as Keenum and what he brings to the team, pending an offensive line that can block. Click here to listen to the full Broncos Blitz podcast with Ronnie Kohrt and special guest Sean Walsh, including what the guys had to say about Vance Joseph‘s job, the offensive line and more, or listen to the podcast below.